How much money do integrators make on equipment? 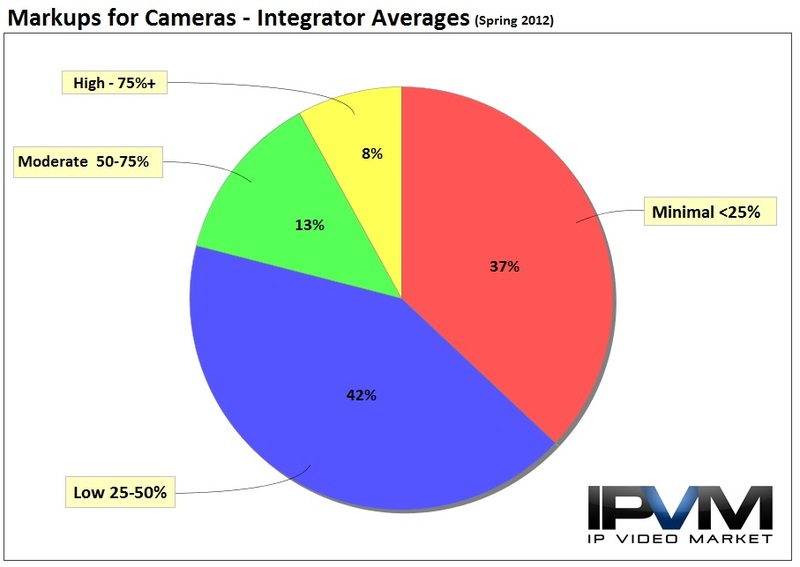 In our most recent survey of integrator members, we asked just that: "On average, what percent do you mark up cameras?" Not only does this answer provide guidance on pricing projects, it provides an uncommonly clear picture of integration business dynamics. In the following note, we release these results and analyze the common themes our survey respondents gave when providing their answer. As reflected in the chart above, the overall average markup was about 35% above cost. In practical terms, if a camera costs $500 and is marked up 35%, the sales price is $675. This is equivalent to a gross margin of about 26% ($175/$675). For those note familar with these terms/concepts, seee our 'Markups / Margins Tutorial'. "Margins 10 years ago were 40-50 %. now it is about half that." "Market drives this and recently cameras are in most cases a commodity." "Preferred margin is 30%, but competitive [times] like this, they may be as low as 12%." In the analysis below, we examine these answers and gauge how they translate into camera markup percentages. The strongest single attribute influencing markup percent was 'competition'. While competing for business is nothing new, the fact this reason was cited as the strongest factor limiting markups validates the market's swing to IP. Despite criticisms citing confounding design, install, and maintenance of IP Video Surveillance, the increasingly common classes of products and installation skill sets in the integration channel are spurring competition based on pricing. "In order to stay competitive in our markets, we are forced to keep moderate margins, otherwise we would lose many bids." "Keep up with integrators who price it cheaper"
"Competition with other integrators and online shops." "Balancing our profit against competitors, and online pricing availability." "The market is getting more competitive." "5 years ago we typically sold in the 25-35% range. However "trunk slammer" integrators have cut deep into our margins. " "The $300 specials constantly keep markups lean." "Very tight market at the moment here in Australia. We need to complete with "van and lader" operators so mark ups of 10% are the norm"
A commonly cited threat to the 'traditional' channel sales model is the easy availability of product pricing on the internet. A byproduct of the 'internet age' of procurement, and aggravated by loose channel protections result in end users finding pricing very close to dealer cost online. While some brands stringently protect the integrator and reseller channel (e.g. : Avigilon), other very popular brands (e.g. : Axis) do little or nothing to police the internet for pricing information. Confounding this problem for integrators are manufacturers and distributors who openly sell direct to the public, bypassing the integrator channel altogether. The end result of this type of selling is a customer base with sharp understanding of product cost, and very little tolerance for integrators marking up equipment. "Because of online resellers, and easy for the end user to do price comparisons"
"Because of the internet publishing rock bottom pricing." "Consumers are also getting access to camera [prices] as well. This industry is moving the direction that the IT world has been in for years. Tiny markups. Not adapting to this trend will mean failure in my opinion." "Internet prices prevent us from increasing our margins"
"As we sell primarily Axis and Panasonic cameras, we keep the sale price at or below the MSRP, which is what you will find advertised online. " "Anything over 20% and we'd be more expensive than most of the online vendors." "Pricing is exposed via the internet and the fly by night integrators don't stick around for warranty." We do not anticipate this trend to diminish in the coming years. In fact, with a rash of DIY-centered offerings becoming popular in the market, it appears that many manufacturers are actively choosing to sidestep the integration channel and market directly to end users. Several integrators cited the prospect of winning Recurring Monthly Revenue (RMR) as a circumstance in which they willingly lower markup to earn a sale. If equipment is sold with the additional expectation of monthly subscription fees for management, remote access, or maintenance services, the integrator is more willing to lower the initial cost of equipment to facilitate signing a contract representing RMR. "If a job carries recurring revenue (service contract, hosted video service, etc) we will get more aggressive on the product pricing as we want the recurring revenue and it's associated equity. " "We target a 50% mark-up, but could go a bit lower if the RMR involved is better." "I give them a little discount since there an opportunity for RMR." "Closer to 25% if servicing is not included in the contract and around 45% if one year servicing is included." "While margin is somewhat important on our camera sales, we tend to lessen these margins in an effort to up sell our field services." Although we have cautioned against wild speculation that VSaaS or Hosted Video is the 'next big thing', selling RMR services can help mitigate low product markups and provide additional opportunities for integrators to make up lean profits. Interestingly, the strategy of 'bundling services' so that video surveillance is only one of several types of services also provided integrators an additional benefit despite tight markups. The efficiency of an integrator being able to roll up several sales efforts into one opportunity, and the ability of the customer to have 'a single source provider' for several systems all translate into lower overall pricing. "The complete solution also plays a role, in some situations where there are many systems and services being offered (Access Control, PSIM, etc.) being offered we can play with the prices more." "If we sell access to the same customer, we tweak prices"
"Big, small, risk of losing your shirt, complexity, competition, are we doing multiple jobs for the same customer (access, fire, audio/video, automation)." "Usually 20-30%. This is typical for most of our equipment. We adjust based on type of customer and the size of the project. Usually CCTV is only a small part of the overall build - we could be bundling access control, intrusion, data, telephone system and complete IT builds." "We generally put more margin on labor than material. It allowed us to swap out material more easily without affecting overall gross profit. We also generally felt we were getting paid for smarts, not parts. Anyone can source material. Very few are true integrators." "Product and software sophistication requires training, increasing staff skills, in turn increases labor costs. Business differentiation in our industry is partially dependent on engineering, design, installation, and support, and quality associated with each of these services has a cost." "on video recorders or computers, [markup is] a bit more to include teaching how to use and maintenance"
"I charge for the work and less for the cameras. It is my time that has to be paid." "customers are less likely to haggle over talent than product"
While some may view this strategy as making the most of an unfortunate situation, the integrators in this group have placed their value in the differentiation where they hold the most authority.